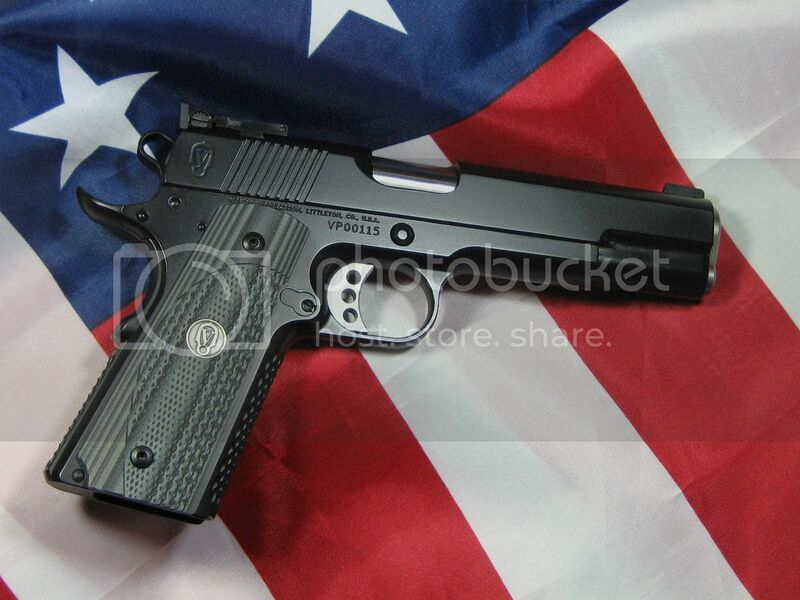 The M1911.ORG E-zine last heard from Luke Volkmann when he was with a different company. Since that last review (March of 2010) Luke has moved on to his own company, solely owned by him, in a different location in Colorado. There have been changes, to be sure. While Luke’s customers still receive his personal commitment to quality without compromise, the options available to those customers has expanded. Not only do those lucky folks get to choose from a wide variety of configurations and embellishments, Luke also offers those upgrades to Colt and Springfield pistols sent to him for custom enhancements. This customizing option from Volkmann Precision will be discussed later in this article. One thing which hasn’t changed is the near-perfection of the handguns produced by Luke in his Littleton, CO shop. That was never more evident than when Downing’s Gun Shop in Cleburne, TX received this latest T&E pistol. The Downings have had a lot of custom guns come through their shop over the years, but they all went on and on about the beauty of the Volkmann Precision Combat Custom. Let’s see why! 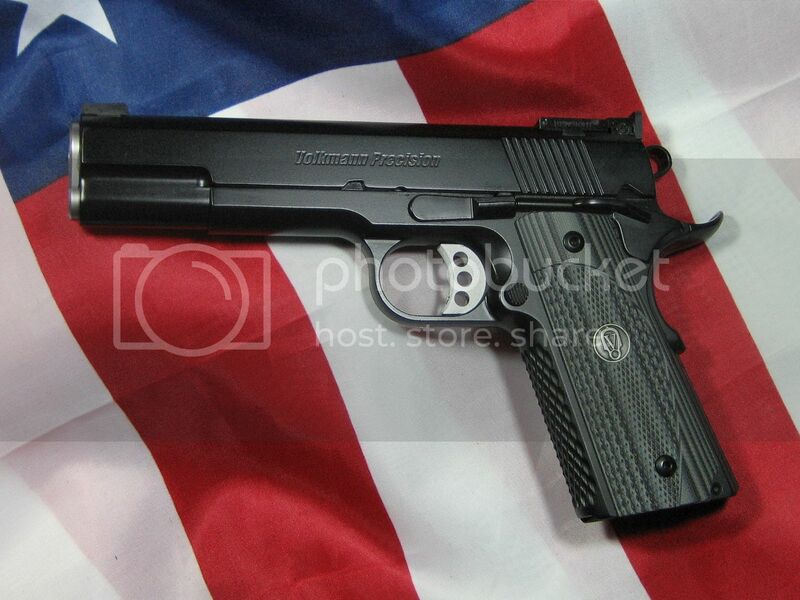 The Volkmann Precision Combat Custom in 9mm is a pistol which was made for a customer who graciously allowed the M1911.ORG E-zine to test and evaluate his pistol, prior to it being shipped to him. We are grateful for his kindness and patience. 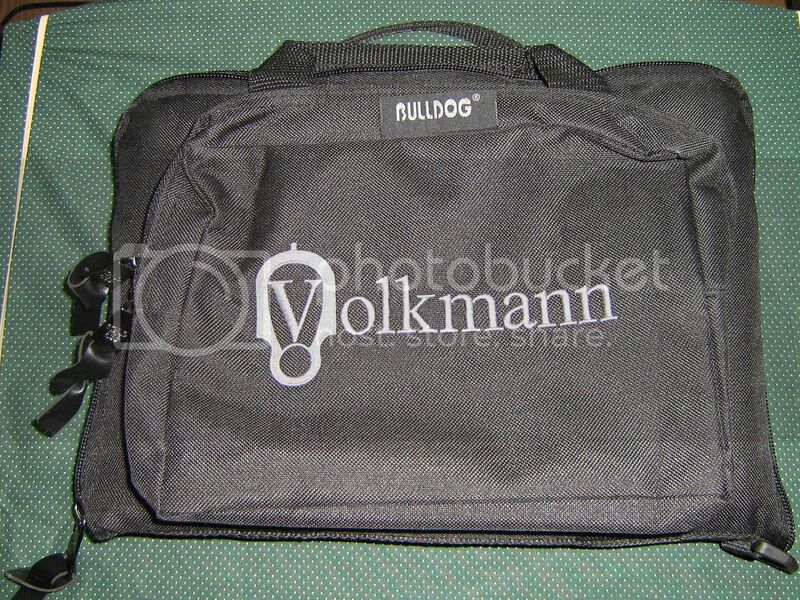 Todd Downing brought out this “Bulldog” brand nylon canvas pistol bag when I went in to pick up the gun. Inside was the gun, three Metalform 9mm magazines, and the work order sheet. 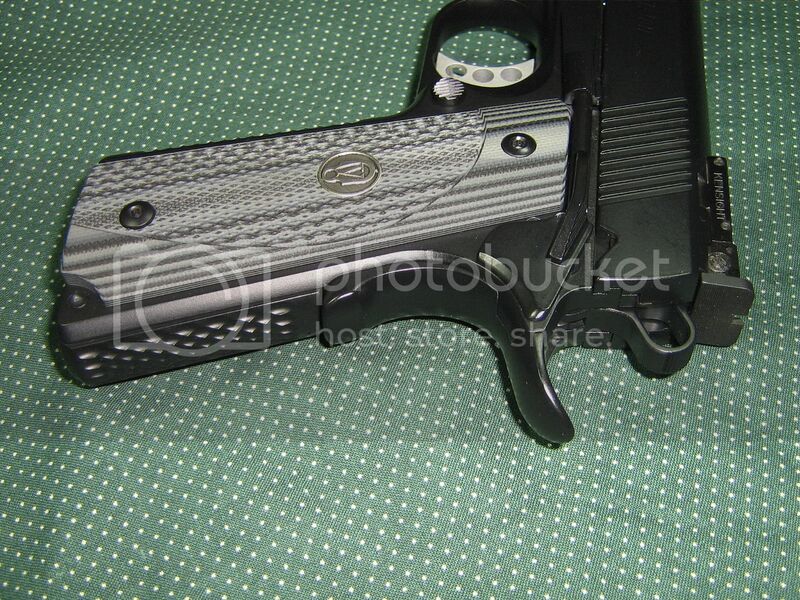 This “glamor shot” photograph of the pistol is shown to illustrate the true shining black color of the pistol with its custom Rockote finish. 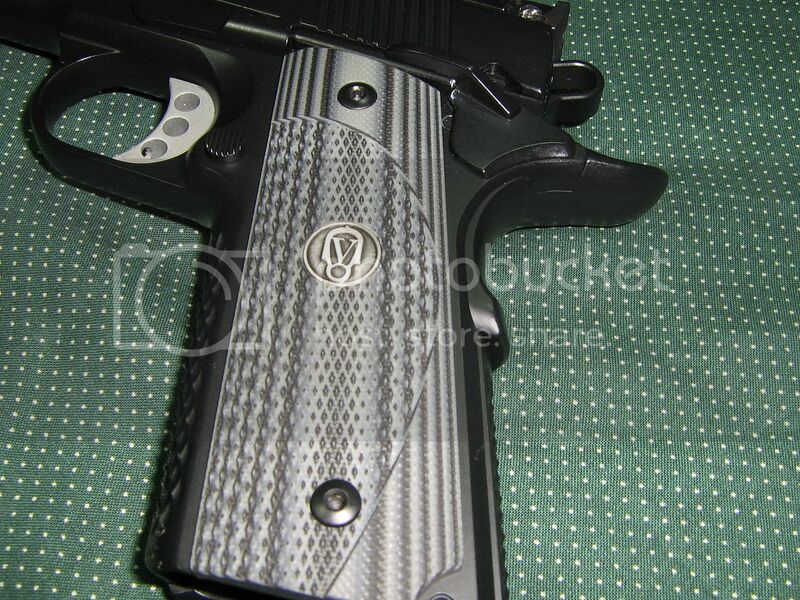 This finish is perfectly suited to the black and grey Gator VZ Slim Grip panels with Volkmann Precision medallions. The photograph (below) was taken under different lighting conditions to show several distinctive features of the pistol. Notice that the slide has “ball cuts” in the area where it meets the dust cover of the frame. On the left side of the slide are the words “Volkmann Precision” ahead of the slanted rear cocking serrations. The owner of this pistol wisely (in my opinion) chose to forego the addition of front cocking serrations. 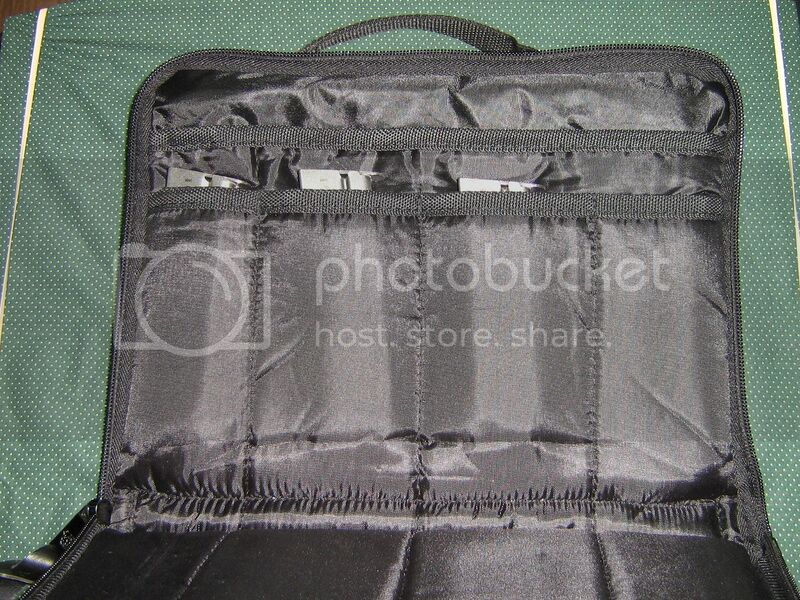 The photo (above) also features the slightly rounded edges at the bottom of the slide. This is not a full-melt treatment, but the edges have been appreciably buffed, and therefore will slice neither human skin nor leather holster interiors. The long 3-hole trigger is serrated vertically, and has a hole for the over-travel screw. While on the subject of the trigger, measurements before, after, and during testing revealed a feature which I have come to expect from Luke Volkmann pistols. After an almost imperceptible take-up, the trigger consistently released the sear with 4 pounds of pressure. Not an ounce of difference either way! 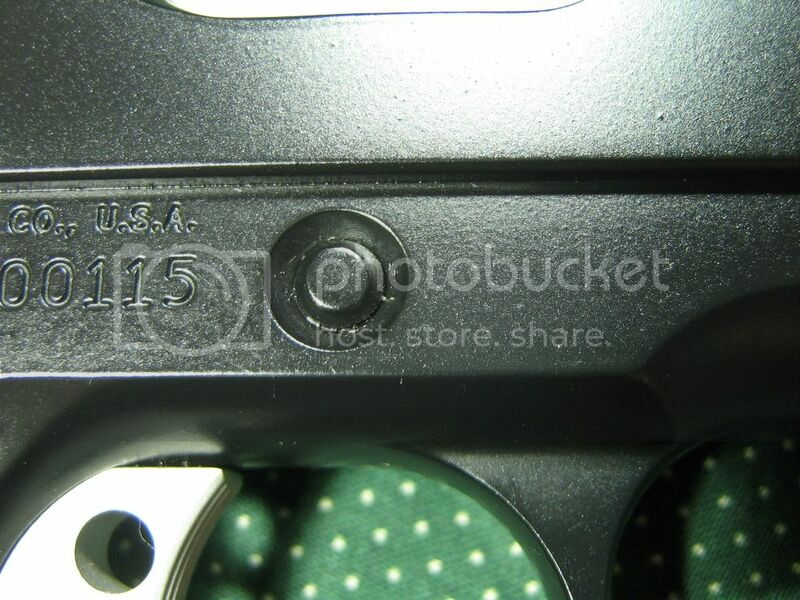 Moving to the top end of the pistol, one first notices the fully adjustable target rear sight. Directly underneath is the Volkmann Precision logo, which is the only marking on the right side of the slide. 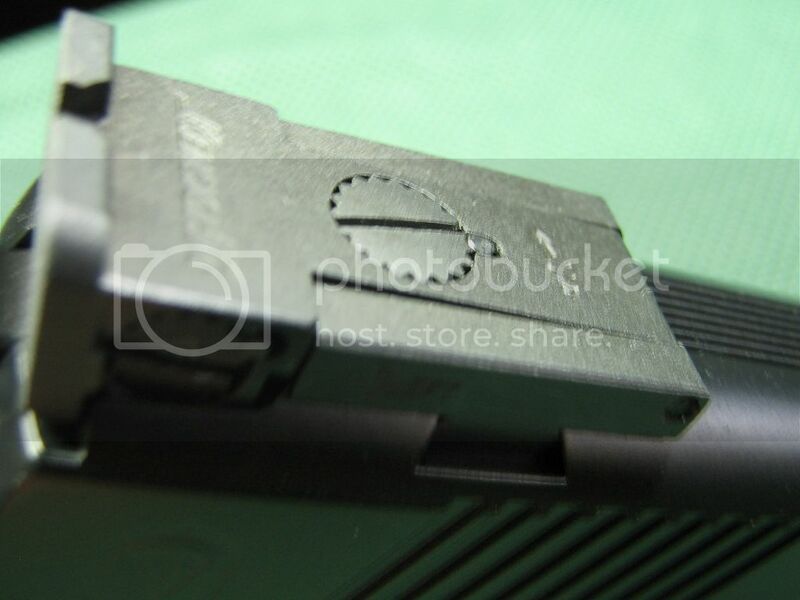 This rather blurry (please pardon me) photograph shows the top of the adjustable rear sight in its dovetail cut-out, and the flat top of the side, which is serrated all the way to the front sight. 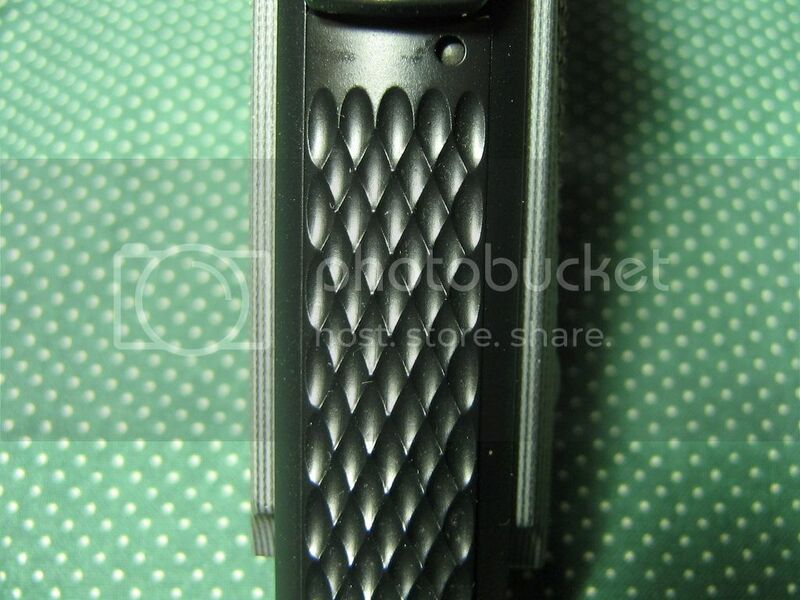 The back of the rear sight is beautifully serrated, horizontally. Starting to the left of the hammer, the excellent fit of the ejector and frame rails to the slide is readily apparent. Moving to the right side, the extractor shows a perfect fit, as do the slide rails to the frame rails. 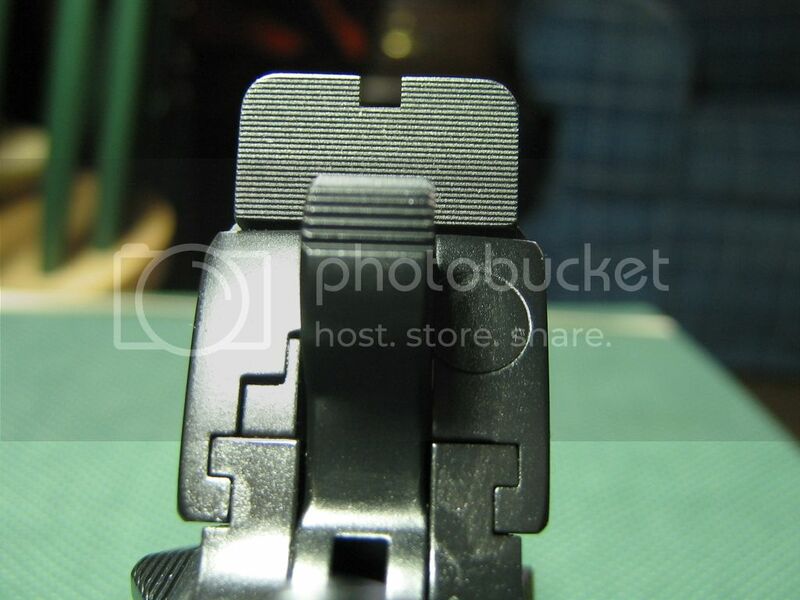 The rear sight has a generous square cut, allowing an unobstructed view of the front sight blade. That’s right! This is a Gold dot front sight, serrated horizontally, and perfectly blended in its dovetail to the rounded portion of the muzzle end of the slide. Also pictured in this photograph are the perfectly proportioned serrations on the top of the slide. The match-grade barrel is gorgeously crowned and beveled. The recoil spring plug has Luke’s distinctive company logo imprinted on the end, and mates almost seamlessly with the stainless steel barrel bushing. This spring plug is an extra charge item, but enhances the appearance of the pistol. The ejection port is lowered and flared to facilitate reliable ejection of spent cartridge casings. 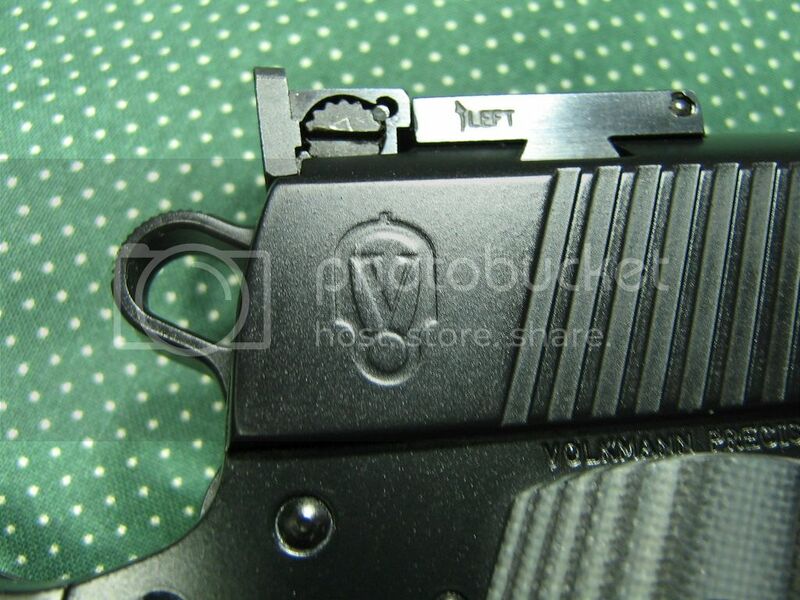 As evident in this photograph, this customer’s pistol has a single thumb safety (on the opposite side of the frame), and sports a recessed and beveled slide stop pin hole on the right side of the frame. 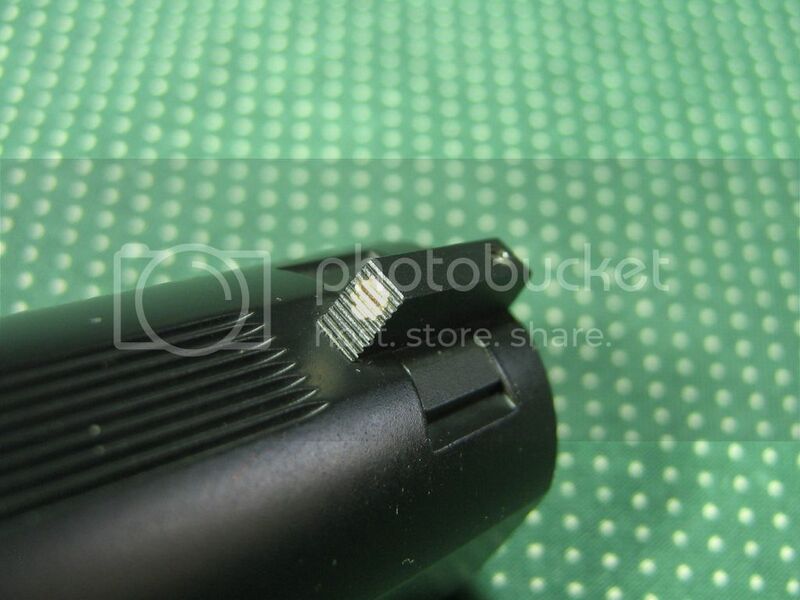 This macro-photograph shows a close-up of the recessed and beveled slide stop pin. This photo shows the thumb safety with its extended shelf. The safety operates in a positive manner in both activation and de-activation, but presents a very slim profile when viewed from the rear. 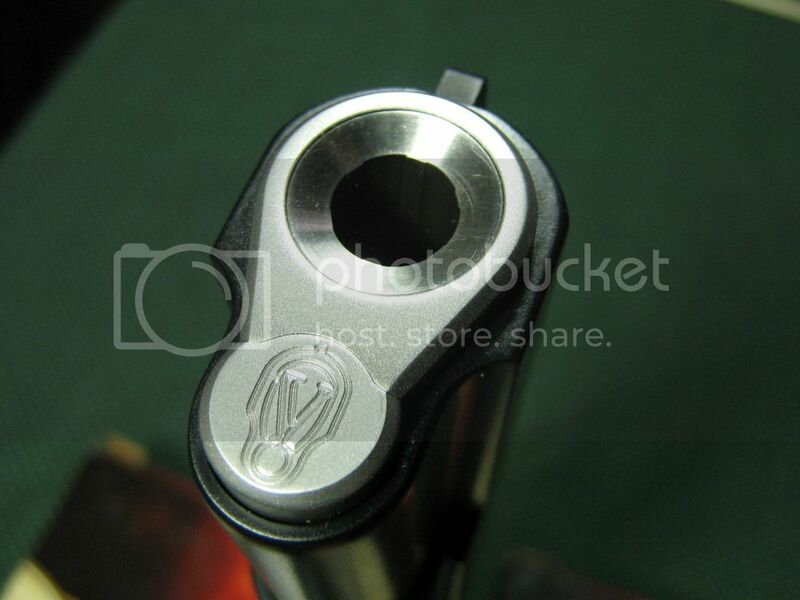 There is enough shelf to allow positive on-off operation when held in the shooting hand. The front strap features an under-cut beneath the trigger guard, and the dimpled area allows a non-slip surface for the hand. 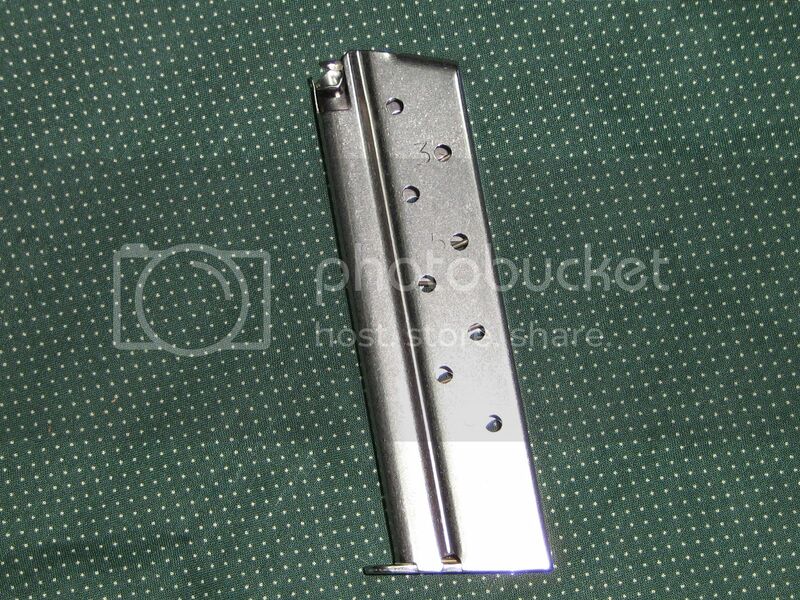 The magazine release is of standard configuration, with vertical serrations on its surface. 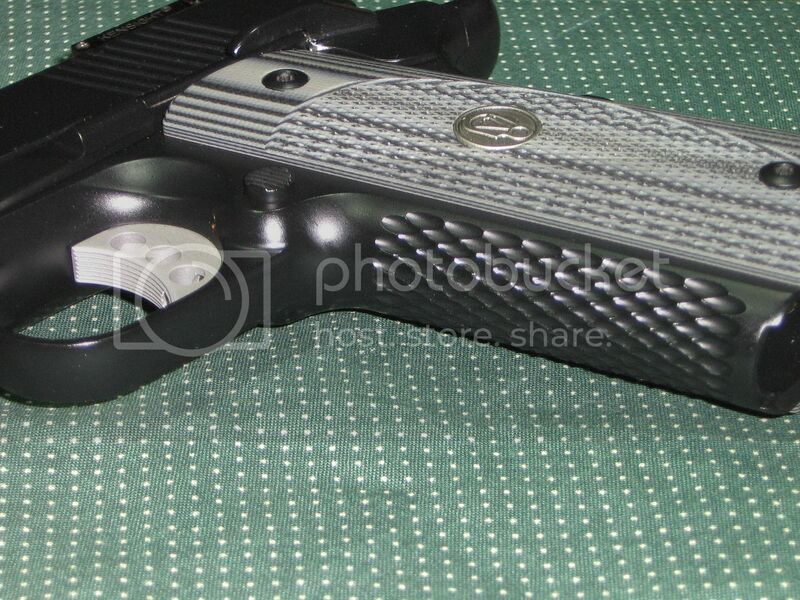 This photo shows another view of the serrated trigger with its over-travel adjustment. A photograph of the rear portion of the Volkmann Combat Custom shows the oval hammer, slim-shelf thumb safety, and beavertail grip safety. The grip safety is standard with a “speed bump”, and no problems were encountered with disengagement of this safety device during extended “combat shooting” exercises. The dimpled mainspring housing is shown in this close-up photograph. These dimples match perfectly with those on the front strap, and combined with the VZ Gator Slim Grip panels, a non-slip grip is attainable, even with wet hands. A close-up view of the VZ Gator Slim Grips with the Volkmann Precision medallion is shown in this photo. 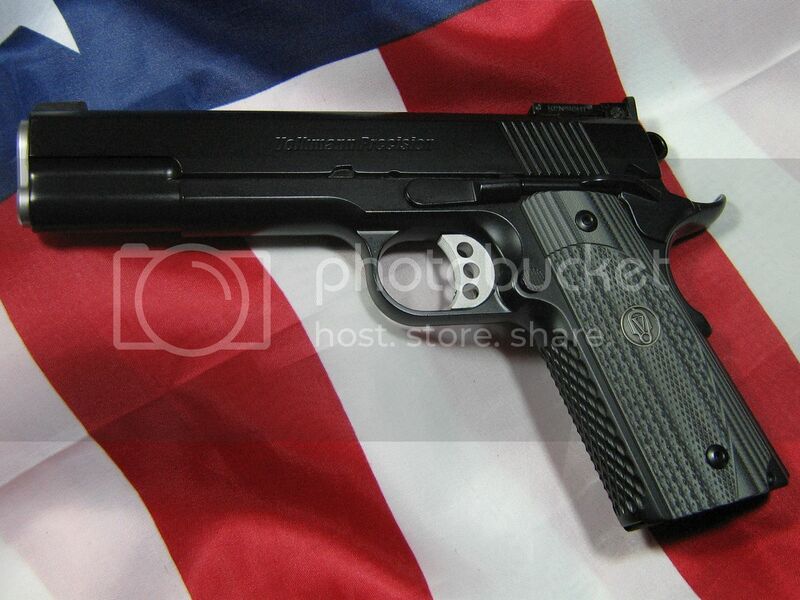 Inasmuch as this pistol belongs to a customer, I took great care in field stripping the gun. Because the monogrammed spring plug fits in a precise manner with the barrel bushing, I decided to follow the same procedure I used when field stripping the Volkmann Combat Carry in 2010. 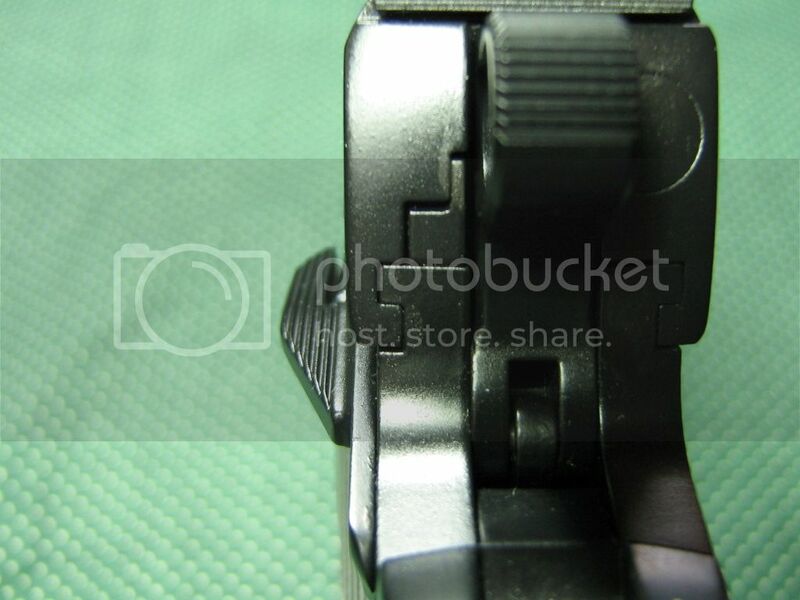 Making certain that the pistol is completely unloaded; push the slide back so the take-down notch is aligned with the hole in the frame where the slide stop engages. Carefully remove the slide stop, and then position your fingers to prevent the recoil spring from flying out of the pistol. Remove the slide from the frame. The guide rod and recoil spring can then be taken out of the slide, and the recoil spring plug removed through the rear of the spring tunnel. A bushing wrench will be needed to turn the barrel bushing, as this part is quite snug over the end of the barrel. The bushing and barrel may then be removed from the slide, completing the procedure. Reassembly is in reverse order, and will necessitate compressing the recoil spring against the already installed spring plug. While slightly difficult, I was able to do this quickly, after a couple of tries. One advantage of seeking out the best possible compromise for concealed carry is my new appreciation of the 9mm. I’ve gone on record (in the past) with my disdain for any caliber which doesn’t begin with 45 and end with ACP. Our brief winters in this part of Texas still allow me to carry my Colt Combat Commander and Defender pistols, but the rest of the year it has GOT to be something smaller. The newest defensive ammunition for the 9mm cartridge has displayed some remarkable ballistic readings. As a result of my new-found respect for this semi-ancient round, I have a plethora of ammunition available for testing, shooting, and in general, enjoyment. After inspecting and oiling the Volkmann Precision Combat Custom 9mm, I loaded up the three provided magazines for a little impromptu reliability and accuracy shooting. Using a variety of factory ammunition, ranging from Federal HST 124 gr. JHP to Armscor 124 gr. FMJ (and several in-between) I fired at soda pop cans, water-filled plastic milk cartons, and even a few watermelons. The results were, in a word, spectacular. The sights, with that beautiful gold-dot front were easily seen and, when using the high velocity self-defense rounds, produced awesome displays of exploded water and watermelon debris. Functioning was flawless, even with the rather pronounced hollow point cavity of the HST bullets. Even after 100 rounds or so of standard to rather “hot” 9mm factory ammunition, the Rockote finish of the pistol wiped down with little effort. I let the gun cool off for awhile, re-oiled the moving parts, and got down to some serious accuracy testing. All the accuracy testing was done from a solid wooden bench, the pistol supported with sand bags, and a two-handed hold. The targets were NRA 25 yard black and white targets, set 25 yards from the shooting table. The 124 gr. Winchester NATO ammunition was pretty much dead-on with the sights as they were regulated by Luke Volkmann. Heavier bullets (147 gr.) and some of the self-defense loads printed higher or lower on the target, but windage remained constant. In an effort to test the adjustable sights without disturbing Luke’s settings, I did some minor adjustments while shooting some of the Armscor 124 gr. FMJ. Raising the elevation screw and moving the windage screw to the left had the desired effects. So I realigned the sights for the return to Volkmann Precision. To further emphasize the phenomenal accuracy of the Volkmann Combat Custom, two of the tested loads (Federal HST and Winchester NATO) created clover-leaf half-inch groups with three of the five shots fired. This is especially interesting, considering my shooting produced the largest 5 shot group while shooting the Winchester ammo. I am quite satisfied with the results of this testing, and even more satisfied with the fact that 400 rounds of much diversified ammunition fed and functioned without incident. As stated early in this article, the test pistol was made for one of Luke’s customers, to that person’s specifications and preferences. The work sheet accompanied that pistol to Downing’s Guns, and was returned with the gun. 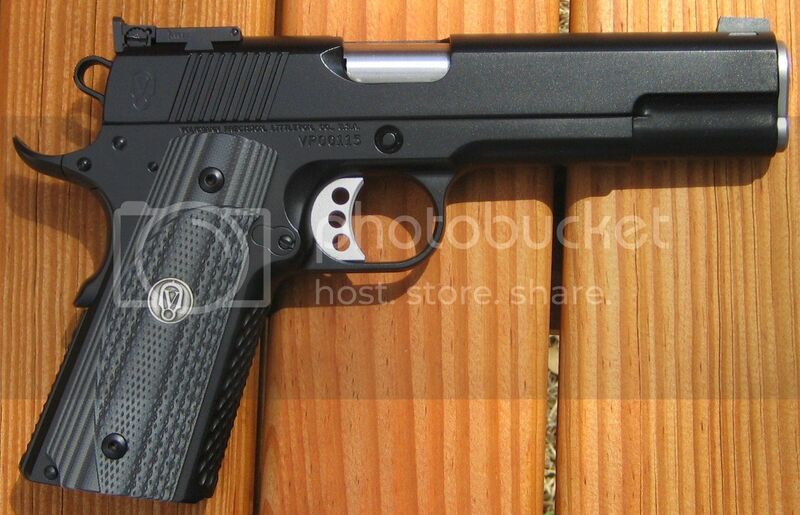 In my humble opinion, the pistol has only one feature I would change, had I been the one ordering it. I own exactly one handgun with adjustable sights, and that is a Smith & Wesson 686 Plus .357 Magnum revolver. While I’ve owned quite a few handguns over the years equipped with adjustable rear sights, I don’t particularly like them. The adjustable rear sight that came on the test pistol is perfect for that platform. 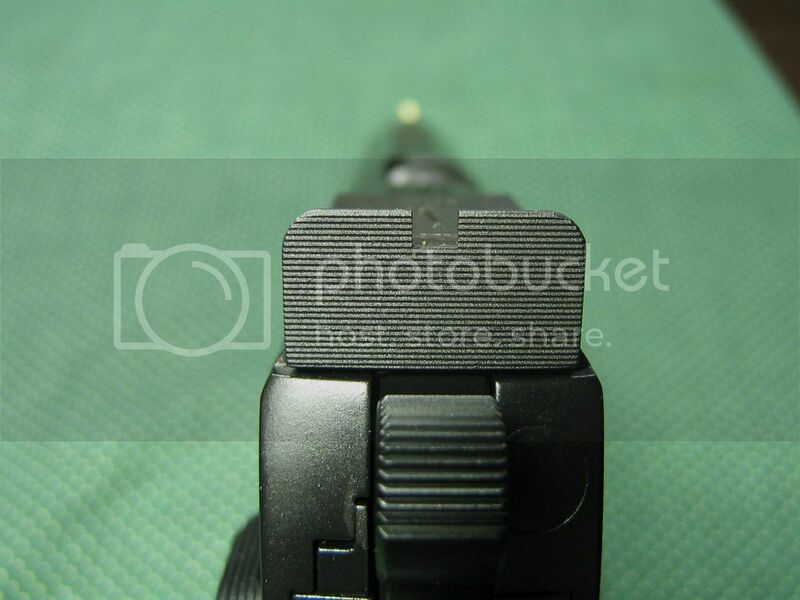 I feel certain that the customer wanted that type sight for the style of shooting he prefers. 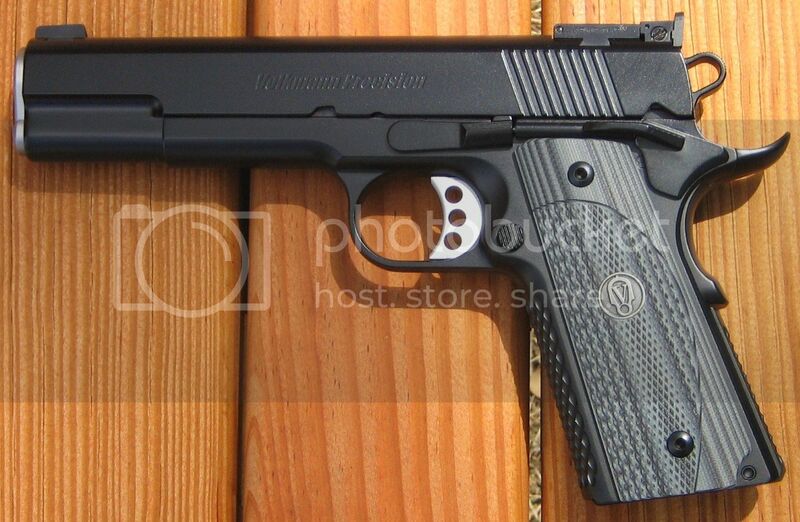 Other than that single personal preference, the Combat Custom has nothing I wouldn’t want on that pistol, and everything else I would. Notice how the out-of-focus gold-dot front sight is still highly visible in this photograph? This was my first experience with a gold-dot front sight, and I am highly impressed with how well that combination works. The pistol displayed absolutely outstanding accuracy. The Rockote finish appears to be durable is quite attractive, and easily cleaned after a shooting session. While no ill effects were apparent after the shooting session, only time will determine the durability of the finish. I have used Metalform 9mm magazines in several of my gun tests, and found them to be reliable and sturdy. I was pleased to see Luke include three of these mags in the Bulldog pistol bag. I’ve been fortunate enough to test and review two other pistols made by Luke Volkmann. Both of those guns were in .45 Auto calibers, and each was superb in its own way. I got an initial feeling from Luke that he was nervous about this 9mm experiment, but he needn’t have worried. This pistol was one of the best shooting guns I have ever fired. Recoil was practically non-existent, and the dimpled front strap, coupled with the VZ grips and dimpled mainspring housing kept the gun firmly in my grasp. Because of the price factor, custom-made guns aren’t for everyone. But for those discriminating hand gunners who appreciate the difference that custom builds provide, Luke Volkmann’s products take a back seat to no other custom pistol maker. And, if you don’t quite have the funds for a custom build, Luke will gladly take your Colt or Springfield pistol, and for about two grand turn that gun into a semi-custom you will be proud to own and shoot. MSRP: Basic Model $2995.00 U.S., as tested $3795.00 U.S. 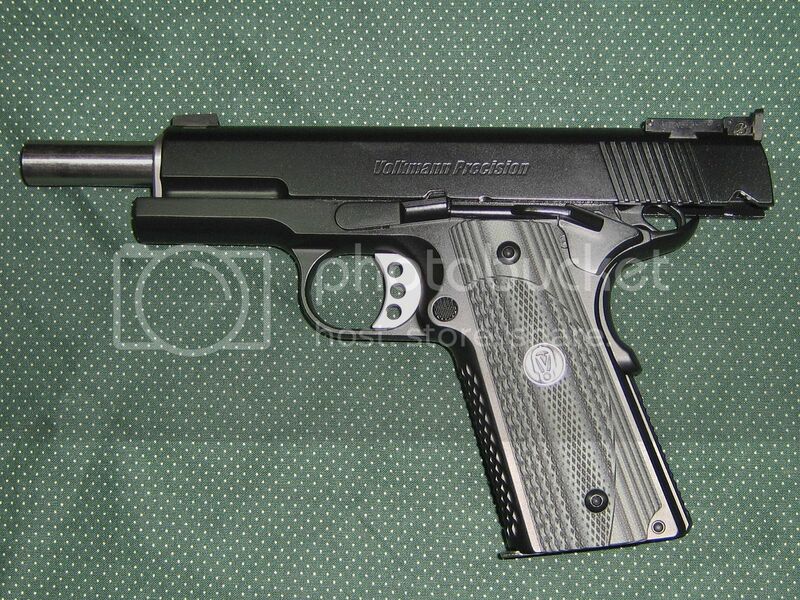 It goes without saying that I owe a debt of gratitude to Luke Volkmann for providing this pistol for the review. I would be remiss if I didin't also thank the "unknown" customer/owner of this gun as well. His patience in waiting for delivery of this fine firearm is much better than most of us would possess. Thank you for allowing me to shoot your new gun, and for trusting Luke and myself with such an investment. I always get a valuable "first impression" reaction to test pistols from my friends at Downing's Guns in Cleburne, TX. If the pistol to be reviewed is "ho-hum", I know it immediately when walking in their door. On the other hand, if the gun is as special as the Volkmann Precision Combat Custom 9mm, I instantly am informed of such by Jerry, Todd, or Carol. Thank you all for your help, your honesty, and your exceptional "gun knowledge". You may discuss this article in our Forums site.